Gustav Klimt: July 14, 1862 to February 6, 1918. He was an Austrian Symbolist painter and one of the most prominent members of the Vienna Secession movement. His major works include paintings, murals, sketches, and other art objects. Klimt's 'Golden Phase' was marked by positive critical reaction and success. Many of his paintings from this period used gold leaf. 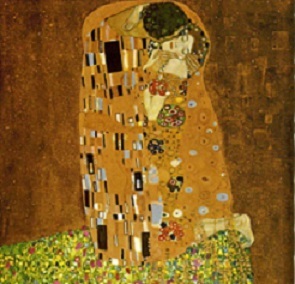 One of the works most popularly associated with this period is the "The Kiss" (1907 to 1908). Klimt travelled little, but trips to Venice and Ravenna, both famous for their beautiful mosaics, most likely inspired his gold technique and his Byzantine imagery. These handmade, Venetian Glass beads are made in honor of and paying homage to the Austrian artist, Gustav Klimt; remembering his art work, "The Kiss". Below the photo of "The Kiss", are our Gustav Klimt Inspired Murano Glass Beads.